Dr. Campbell and Dr. Schmidt are extremely pleased to offer their patients one of the latest and most exciting technological advances in cosmetic and restorative dentistry that allows patients to enhance their smiles in just one visit. The service we’re referring to is same day crowns, bridges, inlays, onlays, and other dental restorations. At Campbell & Schmidt Cosmetic & Family Dentistry, we utilize the state-of-the-art E4D system to design, craft, and place any dental restoration in just one visit to our Lake Forest dentistry practice. Contact our team to find out more or schedule an appointment. Same day restorations allow a patient to leave the office in just one day with their new, metal-free crown that looks so natural no one will ever know they’re wearing it. The way it works may involve state-of-the-art technology, but all you’ll see is a quick, durable, and beautiful crown on your teeth! The appointment begins with the dentist using a special 3D digital camera to capture various images of teeth. It is those 3D images that are used by the dentist to design a new restoration which will match the other teeth flawlessly in shape, size, and color. Once the dentist has finished designing the same day restoration, this data gets sent to the in-office milling machine that fabricates the new restoration using only the highest quality porcelain. When the crown is ready, the dentist adds any finishing touches, if needed, to ensure a perfect match to the rest of the teeth by custom coloring the new crown. It is then bonded into place and patients are ready to go with their complete, beautiful new smiles. The greatest thing about same day crowns aside from the obvious fact that they restore smiles in just one day is that they are more natural looking than ever before. This new technology combined with the highest quality materials allows our dentist to create a restoration that will last for years and years. Same day crowns really do have many advantages over regular crowns such as minimal discomfort since patients only require one set of injections because the procedure takes less time. Same day crowns are also made under the complete control of the dentist while you’re right there in the office. 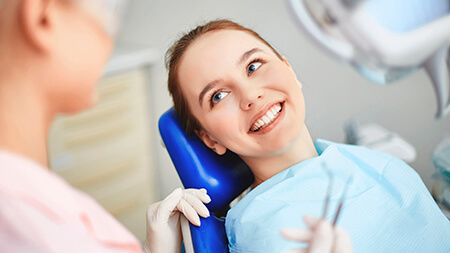 In the case of same say crowns, the dentist ensures that patients get to leave that very same day wearing crowns they’re completely satisfied with. This, of course, means being able to skip the step of temporary crowns while patients wait for a restoration to be made and sent back. Same day crowns deliver instant satisfaction! If you would like to know more about same day crowns, all it takes is one quick call to the office to book your consultation. Dr. Campbell and Dr. Schmidt will be happy to work with you and see if same day crowns in Lake Forest are the right way to restore your smile.